A monthly mortgage payment is an amount that's paid on a mortgage loan each month. Depending on whether you have a fixed or adjustable rate mortgage (ARM), your mortgage payment may be set to a specific amount each month, or it may adjust periodically based on market data. 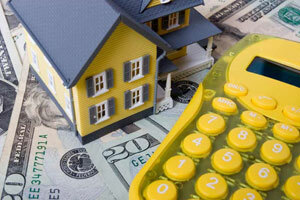 Use a mortgage calculator to estimate your monthly mortgage payment. A monthly mortgage payment may also include a portion of the property taxes and homeowners hazard insurance, known as escrowing. The money paid by escrowing goes into a separate account and is paid out directly to the property tax assessor and homeowner's insurance company when the annual or semi-annual bills are due. Borrowers who are escrowing are not paying anything extra, but paying 1/12th of the annual tax and insurance bills each month which allows them to avoid lump sums. What constitutes a mortgage payment? The more you borrow, the more you'll have to pay each month and over the course of your loan. With all things being equal, you'll pay more each month if you borrow more during the mortgage process. The interest rate is one of the biggest components of your loan. The higher the interest rate, the more you'll pay each month. Try to take advantage of the lowest mortgage rates if you want to save money on your monthly payment. Interest rates will vary depending on your qualifying factors (credit score, down payment, property type, etc. ), the type of loan you choose, the lender you choose and whether or not you buy down your rate with discount points or not. The loan term is the amount of time it takes to pay the loan back. A longer loan term, such as a 30-year term, spreads the money you owe over a greater period. As a result, you'll pay less each month. A shorter loan term, such as a 15-year term, pays the money back over a shorter period which results in less interest paid over time and higher monthly payments. Conforming loans with less than 20% down payment will have a monthly mortgage insurance premium or an upfront fee to cover this cost. As with closing costs, when buyers decide to pay upfront, it increases their total loan amount and monthly payment. Home buyers who choose the monthly option pay the insurance in addition to their regular principal and interest payment --which also increases the overall monthly payment. FHA loans will require an upfront mortgage insurance premium and may also require a monthly mortgage insurance premium depending on down payment and loan term. As mentioned in the opening, You may choose to escrow your property taxes and insurance as part of your overall monthly payment. Depending on your down payment, you may be required to escrow these fees. When many people discuss their "monthly mortgage payment" they include these figures because it helps them budget the actual total expense of owning the home. You may also hear this referred to as a PITI payment. PITI stands for (P)rincipal + (I)nterest + (T)axes + (I)nsurance.